This is a Hoppe's 9 Bore Snake .22 Cal Rifle Bore Cleaner. 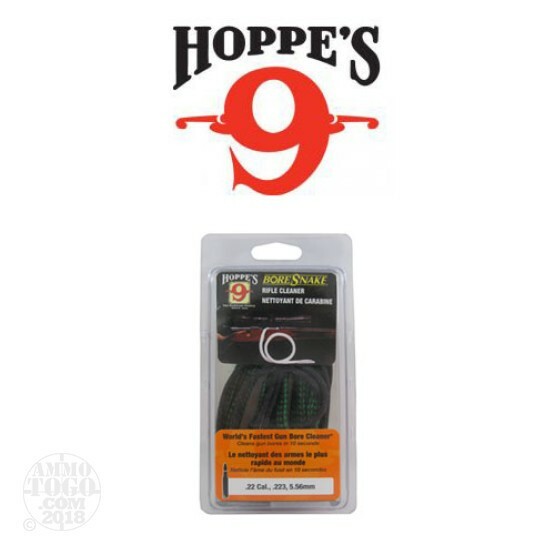 Hoppe’s 9 BoreSnake is the fastest bore cleaner on the planet. One pass loosens large particles, scrubs out the remaining residue with a bronze brush, then swabs it all spotless with a cleaning area 160x larger than a standard patch. Add a few drops of your preferred lubricant and your gun’s ready for storage. -The world’s quickest, three-step bore shine. -Available for rifles, shotguns and pistols. -Brass weight on the pull cord is stamped with the size.